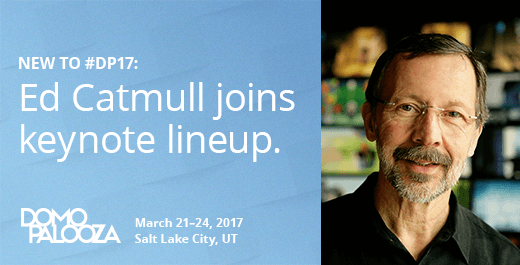 SILICON SLOPES, Utah – January 25, 2017 – Today Domo announced that Dr. Edwin “Ed” Catmull, co-founder and president of Pixar Animation Studios, president of Walt Disney Animation Studios, and author of Creativity, Inc., will keynote at Domopalooza™ 2017. Catmull is lauded for having led a small, struggling hardware company into one the most innovative and creative companies in the world. In 1986, he co-founded Pixar alongside Steve Jobs and John Lasseter. This modest start-up had an immodest goal: to make the first-ever computer animated movie. Thirty-years later, Pixar has dominated the world of animation, producing fourteen consecutive #1 box office hits, which have grossed more than $8.7 billion at the worldwide box office to date, and won thirty Academy Awards®. In addition to his leadership roles at Pixar, Walt Disney Animation Studios and Disneytoon Studios, Catmull is the author of the New York Times Bestseller Creativity, Inc.: Overcoming the Unseen Forces That Stand in the Way of True Inspiration. Creativity, Inc. is a book for managers who want to lead their employees to new heights. It shares the narrative of Catmull’s experiences developing, managing and leading his creative organization. He is a five-time Academy Awards® winner including the Gordon E. Sawyer Award, for his lifetime of technical contributions and leadership in the field of computer graphics for the motion picture industry. He earned B.S. degrees in computer science and physics and a Ph.D. in computer science from the University of Utah. Domopalooza, Domo’s annual customer event, is designed to educate, inform and inspire Domo’s fast-growing community of users from the world’s most progressive organizations and most recognizable brands. Catmull joins a lineup of inspiring speakers including World Series game-changer Theo Epstein and world-renowned statistician Nate Silver. More announcements are coming soon. In its third year, Domopalooza will be held March 21 – 24, 2017, at The Grand America Hotel in Salt Lake City. From keynote presentations to more than 35 breakout sessions, hands-on personalized training and networking opportunities, attendees will gain valuable lessons from industry experts and fellow customers. They’ll gain new insights on how to leverage Domo, and learn how all employees – from the CEO to front line workers – can use Domo to optimize business performance by connecting them to the right data and people they need to improve business results. For registration and to stay up-to-date on the program, visit Domopalooza’s event page. Domo helps all employees – from the CEO to the front line worker – optimize business performance by connecting them to the right data and people they need to improve business results. Domo’s Business Cloud is the world first customizable platform that enables decision makers to identify and act on strategic opportunities in real time. The company is backed with more than $500 million from the world’s best investors and is led by a management team with tenure at the world’s most well-known technology companies. For more information, visit www.domo.com. You can also follow Domo on Twitter, Facebook, LinkedIn, Google+, Instagram and Pinterest. Domo, The Business Cloud, and Domopalooza are trademarks of Domo, Inc.